Mountain bike computers are equally important for mountain bikers. However, not all of them work the same; hence, the need to settle for the best mountain bike computer. Top quality mountain bike computers are loaded with several features that help enhance their performance and versatility. They come with GPS to prevent you from getting lost or to help you catch up with other bikers in-route. Additionally, premium quality mountain bike computers can measure calorie consumption and even show your heartbeat rate, among other things. In our reviews, we have talked about them comprehensively. So, be sure to read each one of them. Lightweight and compact, the Garmin Edge 820 GPS Bike Computer is certainly a great purchase for any mountain biker. It has a 2.3-inch high-resolution display that will let you see data clearly. The capacitive touch display also works with gloves and when wet. The bike computer has a GroupTrack feature that keeps tabs on everyone in your riding pack. It will provide you with bike-specific turn-by-turn navigation as well as advanced monitoring performance. In addition, this bike computer comes with a cadence sensor, which not only fastens to the size of any crank arm but also measures pedal strokes each minute to allow you to get the most out of your biking experience. The speed sensor attaches to the either wheel’s hub, and it calibrates on its own with the Edge, so you can get the much-needed accurate speed and distance every time you are on the road. The CAT EYE –Wireless Bike Computer (Strada) should be among the first products on your list. This is because it displays all the favorite stats. To be precise, it displays max, current and average speed, clock, elapsed time, total distance, two trip distances, and pace arrow, among others. The bike computer is very convenient in that it knows when you have stopped. It will, therefore, stop counting automatically. Moreover, it is designed to make sure that all of your focus is on the ride and not the screen. To achieve that, the manufacturer has designed it in such a way that all you need to do is press its base to toggle through functions. The computer comes with the manufacturer’s FlexTight Bracket, which allows you to effortlessly move, mount, and adjust your computer by hand. This means you will spend more time on the road and less time setting up your gear. With up to 12 functions, there is no way you can give the Bell Dashboard Cyclocomputer a cold shoulder. The 12 functions enable the bike computer to track while you are riding. Another reason why we recommend this cyclocomputer for you is that it is very easy to install. Plus it is weather-resistant to give you peace of mind knowing that it will never be damaged by any kind of weather. The bike computer comes with a one-button cell battery for convenience. It is incredibly affordable, and this means you will not have to crash your bank account in order to buy it. The bike computer displays trip timer, auto stop/start, 12- and 24-hour clock, trip distance, and odometer. Based on how this bike computer is designed, we are totally certain that it will be a great purchase. It will literally improve your biking experience by providing you with all the stats you need. The CAT EYE Velo 9 Mountain Bike Computer displays all your favorite stats. And this is what makes it a must-have for anyone who enjoys riding a mountain bike. It displays total distance, elapsed time, carbon offset, clock, pace arrow, and average, current, and max speed, among others. 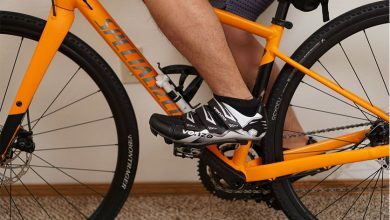 The mountain bike computer comes with a wired speed sensor that enhances its performance. Besides, it comes with a battery that lasts up to 3 years. This means you can install the battery and then forget about it because it will not bother you. 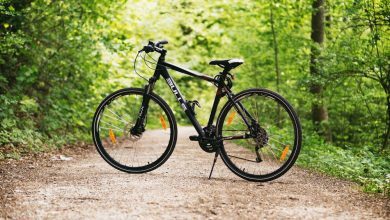 The bike computer is also designed to track calories, and this further makes it the right product for anyone who values their health. It will not weigh you down once you have installed it because it only weighs 28 grams. Its screen is large for quick and easy reading. The computer battery life of this wireless bike computer goes up to a year. Moreover, CAT EYE has equipped it with dual tire size to allow you to use one computer for two bikes. They have also included a digital 2.4 GHz technology to ensure that you get the fastest wireless data transmission with zero interference. Like other CAT EYE Mountain Bike Computers, this one displays what you want to see the most. And some of these stats include clock, pace arrow, elapsed time, cadence, total distance, and current, max, and average speed. This bike computer has the manufacturer’s integrated speed cadence technology, which combines both measurements in a single unit, which is easy to mount. It gives you the option to set the odometer manually, and this eliminates the need to start over every time you change the battery. The bike computer is available in two colors, which are double and triple. The CAT EYE Micro Wireless Cyclocomputer is regarded as the most popular CAT EYE Mountain Bike Computer. Well, this is because it has 10 functions and 12 features. The features include programmable odometer and LED backlight. Furthermore, this bike computer features an easy-to-use and simple bracket, which mounts on both the handlebar and stem. It also comes equipped with a universal sensor mount that attaches effortlessly to mountain bike forks. The bike computer displays 2 elapsed time to 9:59:59, 2 trip distances to 999 miles, total distance to 99,999 miles, and current, average, and max speed to 65.9mph. It also displays other stats, which include pace arrow and 12- and 24-hour clock. Both the computer and sensor use CR2032 batteries. The stats of this bike computer are easy to view, and this is because of the LED backlight. It is a reliable, accurate, and durable bike computer that you should not miss. The speed tracking ability of this wireless bike computer is amazing. It tracks the speed of the rider with a top display of the current speed and bottom display of the average and maximum speed. This unit will also let you know whether you are moving slower than your average speed. It has multiple functions that help improve its performance. Some of these functions include 2 users data recording, 5 language displays, and 2 speed units. It also comes equipped with odometer, stopwatch, and time recording, carbon offset, and calorie counter. Reading data from this unit is very easy, given that it has a big backlit screen that makes it possible to read the data even in the dark. Another feature that makes this bike computer worth spending on is the ideal design. This design enables the computer to mount easily onto the front wheel of the bike. Things keep getting better with CAT EYE products. This wireless bike computer, for instance, is thinner and more stylish than the previous models that have been around. It is actually the evolution of the manufacturer’s simplified wireless computer. It displays elapsed time, pace arrow, calorie consumption, trip distance, total distance, clock, and max, average, and current speed. What’s more, the bike computer has the option to set the odometer manually. Well, this means you will not need to start over every time you change the battery. It also features the manufacturer’s FlexTight Bracket that allows you to effortlessly mount, adjust, and move it by hand. That being said, you will spend more time on the road and less time setting up your gear. The bike computer knows when you have stopped. It, therefore, automatically stops the averaging speed and time. It is a high performing bike computer that you should definitely consider. CAT EYE is a unique company that always listens to its customers and takes their feedback seriously. That’s why their products are highly preferred. 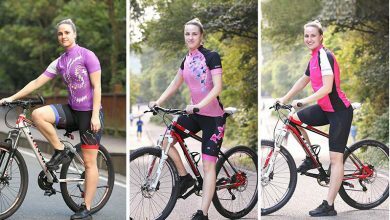 Talking of their products, the CAT EYE – Padrone Cycle Computer is loved by many because it has the features that every mountain bike rider wants. First, it weighs only 31 grams, and this means it is really lightweight. Second, its battery life goes up to one year to save you the hassle of having to buy and change the battery every now and then. The display of this mountain bike computer is also worth mentioning since it is very large, and, therefore, easy to see. Whether you are a farsighted cyclist or a mountain biker, this bike computer is for you. It is great for anyone who wants to enjoy a squint-free ride as well as a fast and simple setup. What made this bike computer make it to this highly competitive list is because of the intuitive interface of the rider’s smartphone to pair, configure workout pages, customize settings, and link to notable cycling apps and wireless sensors. It features GPS live tracking that will let you share a custom link with anyone. 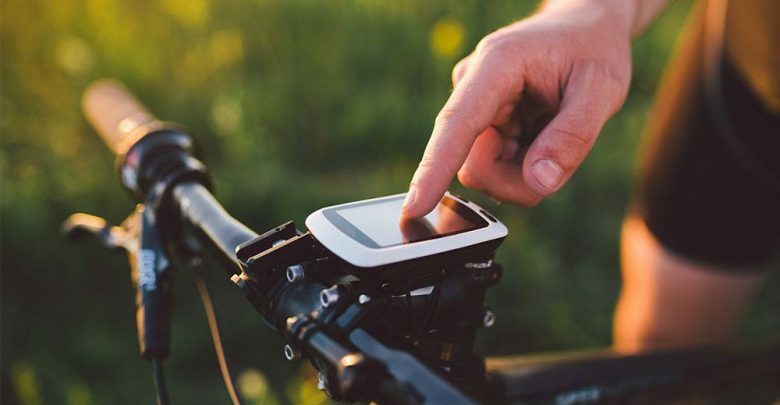 The GPS live tracking is also great for keeping you safely located by loved ones, meeting fellow riders in-route, and keeping you tracked by a coach. Besides, this bike computer allows for wireless connection and uploads. This means it will not force you to tether up to your laptop to upload the software or sync up ride data. It is small and simple yet super powerful enough to completely change how you interact with your mountain bike. The bike computer will provide you with accurate speed, time, and distance. It comes with Wahoo RPM Speed sensor and stem mount. The following are what you should consider in order to land the best quality mountain bike computer. If possible, you should choose a mountain bike computer with the largest display. This is because a large screen is very easy to read even while you are on the go. Also, you should consider a mountain bike computer with a screen that has a backlit. This makes it easy to read data in the dark. Although the battery life of most mountain bike computers lasts longer, it is still a factor to consider before making a purchase. With that said, only settle for mountain bike computers with batteries that last really long, perhaps 1 year, 3 years or more. The number of features of a mountain bike computer should depend on what you plan to use it for. 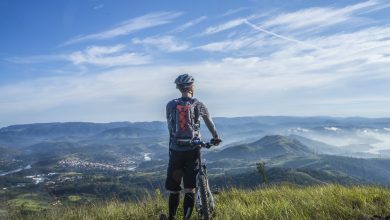 However, there are some features that should not miss from your mountain bike computer. Some of them include data that records max, current, and average speed, total distance, clock, and elapsed time. Also, you can consider a mountain bike computer that has a GPS feature and records calorie consumption as well as heartbeat rate. Most customers ask the following questions before buying a mountain bike computer. What battery does a mountain bike computer use? All mountain bike computers use dry cell batteries. However, the type of the dry cell battery is likely to be different, depending on the manufacturer. Are mountain bike computers weather-resistant? Some mountain bike computers are weather-resistant while others are not. In our opinion, you should choose a weather-resistant unit should you come across it. How many functions does a mountain bike computer have? The number of functions a mountain bike computer has depends on the manufacturer. Nevertheless, most mountain bike computers will not miss features that record max, current and average speed, clock, elapsed time, and total distance. What is the best mountain bike computer? A number of manufacturers produce premium quality mountain bike computers. But the ones that we will recommend to you are the ones we have listed above. They are the best on the market today. A mountain bike computer is a unit that you must have, especially if you enjoy mountain biking. It records and displays important stats to make sure that you are up to date every time you are on the go. Moreover, there are some that record heartbeat rate and calorie consumption to keep your health in check.